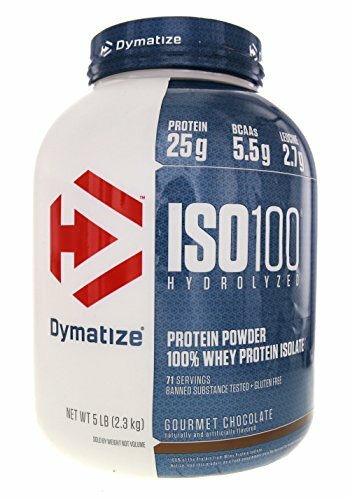 Both Dymatize ISO-100 and Gold Standard Whey protein boast their pure quality and are equally incredible protein powders. Let’s see how they compare head to head! ISO-100 has been the best selling protein supplement from 2013-2015. It isn’t a surprise why this ultra-fast absorbing protein is designed to fuel your body with the purest protein possible for maximum muscle growth and recovery. 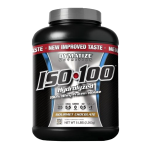 Dymatize ISO-100 is truly a remarkable product which can zero in on your muscle growth goals. ISO-100’s protein source is a hydrolyzed 100% Whey Protein Isolate with an incredible level of bioavailability. What this means is the amino acids at the cellular level can be used instantly once absorbed through the intestines. ISO-100 goes through 5 quality controlled steps to ensure its quality is ultra perfect. As a result, ISO-100 is processed to the peak of perfection; ensuring your body will have the necessary nitrogen balance to build muscle! ISO-100 is of a medical grade quality both carbs and fat have been removed from ISO-100 which leaves you with the most easily digestible protein possible! Maximum protein utilization is critical during intense training periods, and ISO-100 provided exactly what your body needs when it needs it! Each serving of ISO-100 contains a staggering 24 grams of protein, making ISO-100 86% protein by weight! This makes ISO-100 an incredible value as you are receiving no filler in this product. ISO-100 mixes like a champ, you will not believe how quickly ISO-100 goes into solution. Since ISO-100 has no lactose it is very easily digested by those who have any dairy allergies! With zero carbs and zero fat, this isolate gives you everything you need and none of what you don’t need! Have you been frustrated in the past with protein powders that cake the sides of your shaker leaving half of the protein to waste? ISO-100 mixes instantly into solution allowing you to get every drop of protein to fuel your workouts! ISO-100 has a best in class taste and consistency that ensures your satisfaction. You can get a wide variety of flavors perfect for your preferences. With the purest form of protein, you can be sure that there will be no clumps of protein anywhere in your shaker! This protein powder has been heralded as the most easily mixed protein powder on the market! This is a real sticking point for most people looking for a smooth protein shake experience. Dymatize has been a worldwide leader in sports nutrition for more than 20 years. Dymatize has some of the world leading University sports nutrition researchers available. With every passing year, Dymatize invests millions of dollars in product testing and research to ensure safety and effectiveness. Dymatize stands behind its product and is an industry leader that can be trusted. Gold Standard is just that, an industry trendsetter. Gold standard Whey is a giant in the supplement industry and has set the stage for a difficult to match protein isolate. Gold Standard makes it difficult for other supplements to beat it on both value and effectiveness. 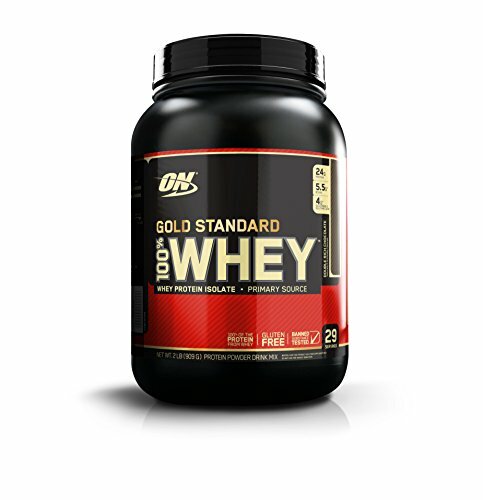 Gold Standard also claims to be the #1 protein powder isolate on the market, let’s see why. 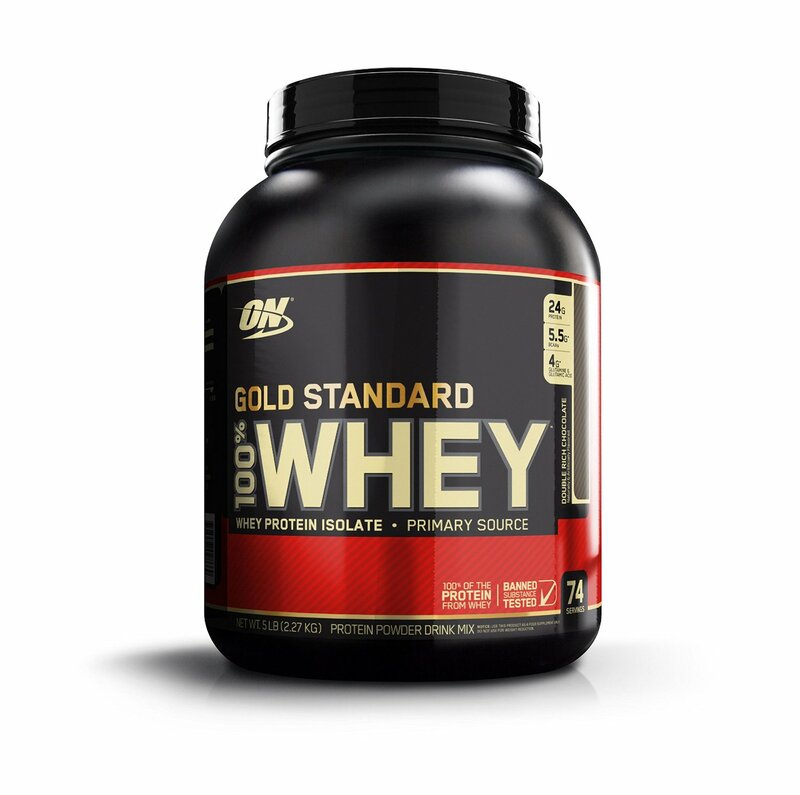 Gold Standard is made up of three whey protein (whey protein isolate, whey protein concentrate, and whey peptides). It also contains amino acids including the three most valuable BCAAs (Leucine, Isoleucine, and Valine). Every scoop comes with 24 grams of protein, 1 gram fat and 3 grams of carbs in an impressive 120 calories. 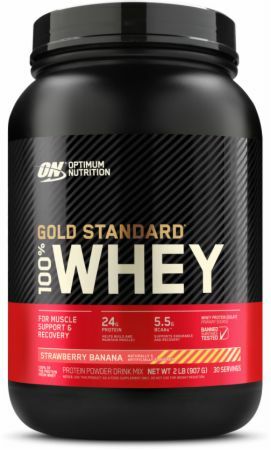 Gold Standard 100% Whey comes in 16 different flavors to meet your needs. The powder dissolves quickly and easily. You will experience no clumping and a will experience a smooth texture. The taste and texture is of such a high level you forget that you are even drinking a protein shake, it is truly a joy. It is a well-known fact that Whey Protein Isolates are the purest form of whey protein that exists. 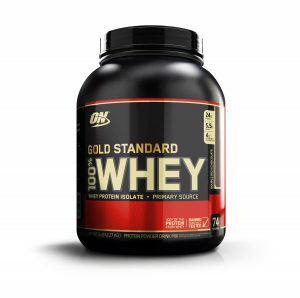 Gold Standard Whey uses proteins that are strategically broken down (hydrolyzed) into smaller pieces called peptides which the body can use instantly bring about a positive nitrogen balance during grulling workouts. Gold Standard builds upon extensive research to provide a fantastic product at a great value. Gold standard has been developed with the athlete in mind. As such this protein has been tested extensively for banned substances and is truly a remarkable product for the competitive athlete and recreational athlete alike. Gold Standard is also Gluten free so you do not have to worry about any fillers causing any allergic reactions. Optimum Nutrition has held the number 1 spot on the Bodybuilding.com top 50 products list for over 10 years. A whopping 28% of the most popular products on Bodybuilding.com come from Optimum Nutrition. 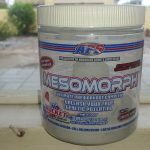 This level of popularity is shared across the bodybuilding space and is evident of this product high level of quality and trustworthiness. 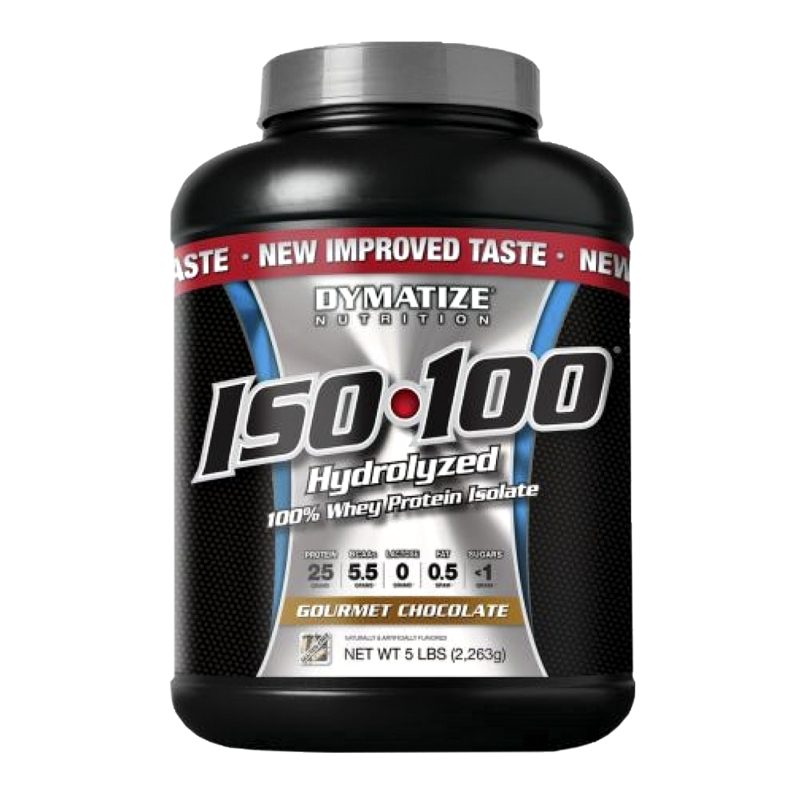 Overall the battle between Dymatize ISO 100 and Gold Standard Whey really comes down to a couple factors. 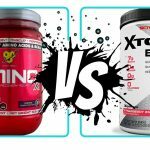 Both products are equally on top of their game Hydrolyzed Whey products. Both products are giants in the supplement industry and have a large track record for both performance and quality. 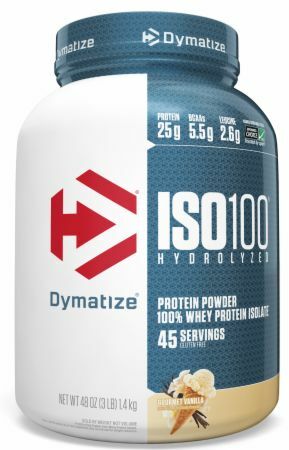 Where the products differ is that Dymatize ISO-100 offers a slightly more expensive protein powder that is Lactose free, Zero Carb, and Zero fat; whereas Gold Standard Whey contains small amounts of carbs, fat, and lactose at a lower cost. 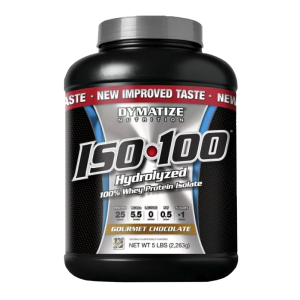 Both products contain highly digestible Hydrolyzed protein, however, Dymatize ISO-100 offers a slightly more pure product with a higher price tag. 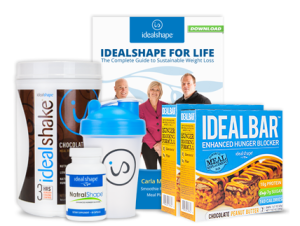 Overall both products are a perfect supplement to a healthy diet and exercise regime and it really will come down to a couple of very minor preferences when choosing between the two. "Dymatize ISO-100 - 5 Lbs. - Banana "